On September 22nd, The Creator’s Project, a global network aimed to introduce and connect artistic individuals together, returned to Seoul to put on one of their signature technology-infused concerts. 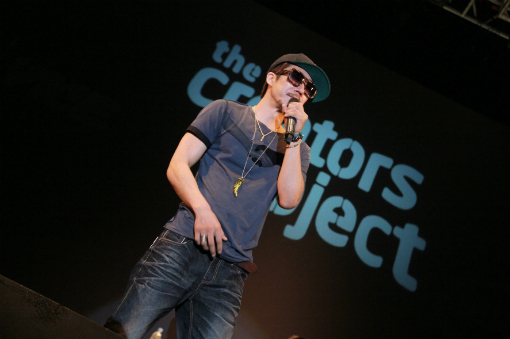 Tiger JK was selected as the Korean representative for a 3rd straight year and was invited to perform. The event featured both Korean and non-Korean acts, thus inviting a diverse crowd to explore the multitude of talent. However, when Tiger JK stepped on stage, he was met with a group of Caucasian hecklers who repeated told him to stop rapping and instead dance the now internationally known horse dance from Psy’s “Gangnam Style.” JK took offense to the comments, seeing it as not only disruptive, but also racist. While JK has been openly supportive on Twitter for Psy’s success, he does not agree how some Western media has disregarded Psy’s talented, and instead have focused on his comedic dance. As some fans have pointed out, it has repercussions for Asian artists who are seeking to make their own unique mark in the Western market. While his actions have turned off some fans, many who have seen JK’s previous anti-racism actions have empathized and forgiven him for this one-off moment. Though I try to keep my personal opinions out of my posts, I will end this with a personal account for those who are quick to label JK as a racist (Warning: This will be long, so grab a drink and some popcorn). I have run this website for over 11 years. I am 100% Filipino, born and raised in a city of diversity (NYC). When I first started listening to Korean music when I was 14 years old, I was one of the few non-Koreans listening to it then. I tried to make Korean friends so I could find people who shared my musical taste. Some laughed and labeled me a wannabe. I would post in K-music forums, and was not taken seriously because I was a “fake Korean.” When I would go to festivals to see Korean singers then, I would get dirty looks. I could not speak a word of Korean then. I was in love with Drunken Tiger, then a group, and decided to fly out to Los Angeles to see them perform live. I had met a few Korean singers before, but when I met them, it was the first time I felt I was seen as a person, not just a fan. What most people don’t know is at that time, when Korean artists had non-Korean fans, most of them were Asian. DT was the first to have a large non-Asian following, but these fans usually knew little about Korea and Korean music. From that, this site was born, obviously it was larger then than it is now, and despite my race and my inability to speak Korean, DT named my site as the official English site in 2003. My race to this day has never been brought up in conversation, nor has it been an issue. I have been to countless performances, and I have seen JK show after show give pounds to his non-Korean fans in the crowd. He has treated them with the same respect he has treated me all these years. I’ve gone from his fan to his friend. I’ve met his closest friends, his family (not just Yoon MiRae), some Korean, some not. People have forgotten that one of his closest friends, Micki Eyez, who spat verses on DT2-4, is Caucasian. When comedians were using blackface on Korean TV, and when netizens criticized his wife and child for being mixed blood, he fired back on Twitter explaining the negativity attached to blackface. He criticized those who judged others based on skin color. He was one of the first to open dialogue about racism in Korea. I have sat backstage with JK and a Caucasian fan, whom he personally invited and chatted with for hours. He did this to thank her for making creative videos of him. His outburst this past week he admitted (both publicly and privately to me) was a foolish mistake. It was an impromptu response that was in no way a reflection of who he really is. He is one of the last people I would call a racist. I was not asked to write this by him, nor his label. I am writing this as a friend who wishes to see people really know him for him. There is no way everyone will forgive him, and I am not asking for it, but I hope this can balance the coin on perspectives. Please share my story with others who need to know. Anybody that believes Tiger JK is a racist knows nothing about him and are just plain ignorant. He had every reason to be offended as a person, Korean (Asian), and a Hip-Hop artist. He’s not a circus clown for people’s enjoyment. He came to spit, not dance. Psy has put in so much work for his music and it’s pretty sad that he’s known just for a dance over here. Tiger JK is THE reason why I got back into Korean music after hearing and seeing the way most Koreans seemed to view brown/black people or people who are mixed with the “wrong” type of Asian. When I read his comment after the “Blackface” crap followed by random, ignorant, and racist comments, he not only got a huge fan back for him and the whole Drunken Tiger Jungle Movement but I’ll have that man’s back forever. Tiger Jk just got lost in the moment,that could happen to anyone. I ‘ve been a Drunken Tiger Supporter for 12 years and if i know one thing it’s that Tiger JK is NOT a raciest. I think i can speak for the whole Drunken Tiger Jungle Movement by saying we’ll always have your back JK. Oh and just a little word for the wise. I’m White. Read and shared. So much respect for Tiger JK and always been supporting his advocacies. I just wish them people (racist) learned something here… thanks for sharing. Yeah, he isnt a racist….unless it comes to white people. He even admitted in his twitter responses that he is racist towards them. He only said sorry for was saying the things, not for actually being a racist. He openly admits to being a racist when he said he wasnt proud of being racist towards white people. How is that an apology? He is a phony who has lost this fan. Tiger JK anti-racism….but only if its against black people. I guess you cant truly speak your mind here. Thing is, he openly admited in his twitter post that he was racist against white people. He needs to answer to that. How can people say he isnt racist when he himself said it? And i hate to tell you, wanting JK to do the horse dance isnt racist. Rude, sure, but not racist. Considering this website is like the DT neighborhood, I did not initially approve of your comment because this is a place of love for Tiger. I have firsthand seen how criticizers and haters can ruin a celebrity’s website. However, your comment was not completely inappropriate. I realized I was wrong by not letting people have their own opinion and letting fans read your perspective. While I respect everyone is entitled to opinion, I would like to chime in to your comment. Given your response, I am confused if you actually read the full article, including my personal experience with JK. During the time I was listening to Korean music, I suffered an enormous amount of scrutiny from Koreans, and even got “the look” by some celebrities at their autographing sessions. DT not once to this day told me I was below them because “I wasn’t Korean.” Out of all people, I feel I am the epitome example of J’s non-racism. Secondly, while the comment itself, “do the horse dance,” does not carry any racism within it, it’s the contextual tone in which it was delivered which alarmed JK. As an unfortunate result of Psy’s success, those unfamiliar with Korean, let alone Asian music, group many other Asian rappers as the same as Psy. There is nothing wrong with Psy, but this is pretty much taking one small thing you know about a culture, and assuming all those associated with that culture are like that. It’s not that far off from saying all Asians know kungfu or serve Chinese food. That IS racism. Third, you claim to be a fan of JK, but how well versed are you in his actual musical history? If you go back to JK’s first solo, “Call Me Tiger,” in 1995, you’ll see Micki Eyes on there (Caucasian) and then him coming back for DT1-4. The two of them have been close friends since high school. Have you seen the guy who starred in the MV for “Great Rebirth?” A white guy, who also grew up with JK. To this day, if J spots a non-Korean at his show, he gives them pounds. I have known J for 11 years, followed his career for 14. I can’t even count how many times I’ve seen J be so real and cool with his non-Korean fans. I do not think there is any minority in the world that has not felt marginalized by the White majority. And yes, if you actually do the studies, we live in a Westernized world mainly associated with Caucasians. Many countries now speak the language of the “White man” (English) thanks to past European imperialism. In addition, if you live overseas, the common notion of Westerners is that they are White, not Asian, African-American, Hispanic, etc. This is thanks to our wonderful media that exports TV, films, and images of mainly Caucasian celebrities to international countries. Unfortunately, the effect this has on both Americans and oversea viewers is whatever image of non-Whites is shown is what small exposure some people have to that culture. This spreads a horrible one-dimensional idea of minorities, which doesn’t sit well. All of the factors put together has an impact on people, some less than others, but not one is innocent of having a spontaneous racist moment, not even Caucasians people. That being said, I love White people. I went to a university that was 63% Caucasian and a high school that had similar ratios. But there were definitely moments where I wanted to scream out, “Hey, how come we keep learning about Europe? How come my school has a club for Polish people, Irish people, but not Asians?” What J was responding to was the lack of understanding and the oppression that Westernized mass culture has had on others. We have come a long way of integrating muliticulturalism, but not to the extent where all colors are TRULY understood fairly and viewed as equal in every aspect. If you would like to go on and not support J, I respect that. I said it already up there he can’t win back every fan. You seemed adamant about making your comments heard, so I am opening up the floor with my own response.